Windows Update is a service offered by Microsoft which provides updates for Windows components. It can be replaced with Microsoft Update, an expanded version of the service which provides for other Microsoft software as well, such as Microsoft Office, Windows Live Essentials and Microsoft Expression Studio. The service provides different kinds of updates. Security updates or critical updates protect against vulnerabilities to malware and security exploits. Other updates correct errors unrelated to security, or enhance functionality. Automatic Updates is a replacement for the Critical Update Notification tool. Unlike its predecessor, Automatic Updates includes the ability to download and install updates without using a web browser. Instead of the five minute schedule used by its predecessor, the Automatic Updates client checks the Windows Update servers once a day. The user is given the option to download available updates then prompt the user to install them, or to notify the user prior to downloading any available updates. After Windows Me is installed, the user is prompted via a notification balloon to configure the Automatic Updates client. Microsoft routinely releases security updates on the second Tuesday of each month (Patch Tuesday), but can provide them whenever a new update is urgently required to prevent a newly discovered or prevalent exploit targeting Windows users. 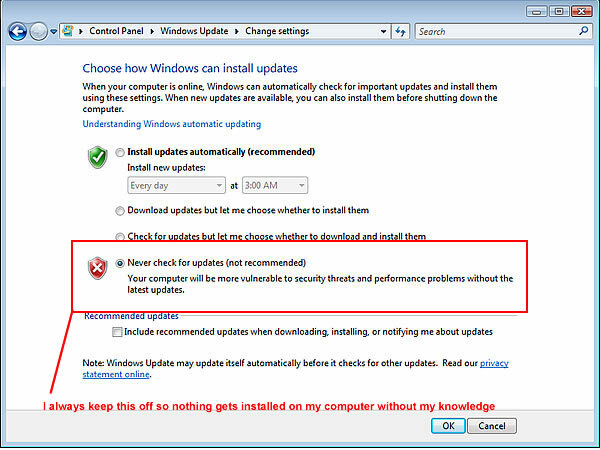 System administrators can configure Windows Update to install critical updates automatically so long as the computer has an Internet connection, without the user needing to install them manually, or even be aware that an update is required. Now, I realize what I am about to explain may sound counter-intuitive however through my own experience, I find it to be true! Now there is a downside to Windows update. Sometimes, when Microsoft does an update it can alter the behavior of how your system is running. There have been cases where certain programs run very smoothly and all of a sudden the following morning after an update, it no longer runs properly. This can wreak havoc on mission critical computer server that runs specialized software. Something in that update creates more problems than it is trying to solve. Another downside of Windows update is that your computer can start getting slower. This is because Microsoft is installing new stuff related to the operating system and this can in turn use more memory, more hard disk space and over time make your computer slower than simply having the first revision. Also by running Windows update, you risk the chance of Microsoft releasing an update that can have a major operating system flaw. This can wreak a lot of havoc until the next update is released which fixes the previous bad update. This is a bad road to go down especially if you have important stuff that you are doing on that computer. With automatic updates turned on, all this is being done when you aren't aware of it. I have installed my operating system a few times on my PC using the original Windows disk. I find that when I do this, my computer seems fresh like it just came out of the box. So then why over time does it get slower? Well once the Windows operating system is installed, then you run Windows update. It then downloads all the service packs and updates up until the current point in time. I have found that once I install the operating system, low memory usage anti-virus software like Avast Anti-virus, and all my necessary software to keep operating, then that is it. My computer lasts a long time before a re-install is necessary. It doesn't slow down. Sometimes a reinstall will never be necessary for as long as you keep the computer free of adware and spyware. Yes, I understand that these updates help to protect that like Windows defender and other security updates but I use an anti-virus software (like Avast) that is suppose to already take care of stuff like that. I don't need multiple anti-virus software fighting with each other trying to do the same job. I have not had any fewer problems should the computer get a spyware or adware whether the computer has been updated with windows update or not. When you get a computer with the factory settings and operating system the 2 are usually very compatible with each other. Once you start altering the operating system by adding to it, you slow it down and thus you slow your computer down. I also realize that updates also improve Microsoft's Internet Explorer and that is a good thing. But if it requires more memory overall to maintain that fresh speed then you will need to evaluate whether it is worth it. However, using FireFox and/or Google Chrome can accomplish the same task without the update so it doesn't really matter. Now one thing I want to point out, if you got your computer in 2008 and you install software from 2015 then there is a good chance that the software you install will slow down your computer. This is simply because your computer is out dated and as a whole needs replacement. The bottom line is if you have a well running operating system, anti-virus and programs that you are using then any chance of altering that may adversely affect your computer's performance. Again, I am not saying that Windows Update is a bad thing but once you get your computer working and working smoothly then leave it alone. Stay away from websites that may hurt your computer. Here is more information on how to speed up your slow computer.